Dr. Ian Barwick is committed to giving you all the information you need to make informed choices about your dental care. Dr. Barwick will never tell you that you need to have a certain procedure. The Intra-Oral Camera allows you to see exactly what Dr. Barwick sees. Digital Radiography, allowing for less X-ray exposure, higher accuracy and immediate viewing. The CAESY Patient Information System provides important visual information on monitors in the treatment rooms. Many patient handouts and brochures describe dental procedures and post-op instructions. The “Patient Information” tab on this website provides everything you’ll need for your upcoming visit in one convenient place. Dr. Barwick loves to be on the cutting edge of the practice of dentistry, while at the same time staying old-fashioned about building relationships. He values getting to know you not just as a dental patient, but as a person. He wants to find out what concerns you, and whether you have any questions. There are just some things technology can’t replace. And who wouldn’t have fun in a practice with a patient-centered approach and the goal of changing lives for the better? It’s our honor to be a part of improving quality of life for people daily – we improve smiles, boost confidence, and even help people live longer and healthier lives by managing breathing and snoring issues. Providing safe, quality care is something that Dr. Barwick is very serious about. He’s also serious about staying on top of the latest developments in dentistry and improving existing techniques to enhance patient safety and comfort. Always keeping safety in the forefront of our minds. Remembering that many people have had bad dental experiences in the past. Making mutual decisions with patients. 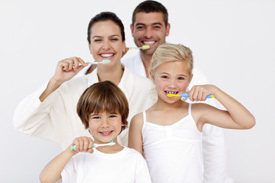 We’d like to demonstrate our commitment to providing an enjoyable, high quality dental experience for our patients. We offer a range of financial options, so you can pay at a rate that is comfortable for you, rather than going without care. Please take a look through our site and give us a call at (978) 957-5511 with any questions, or to schedule an appointment. We look forward to welcoming you into our family!